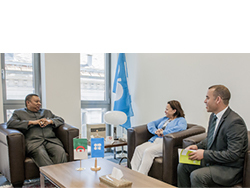 Vienna, Austria, 23 August 2016–OPEC Secretary General, HE Mohammad Sanusi Barkindo, today received Algerian Ambassador to Austria, HE Ms Faouzia Mebarki, at the OPEC Secretariat in Vienna. Ms Mebarki began by passing on her congratulations to Mr Barkindo following his assumption of the role as Secretary General of OPEC and, as Algeria’s Ambassador to Austria, she offered her full support to him and the OPEC Secretariat. Mr Barkindo said the Ambassador’s visit was an important and timely one given the current oil market situation and the upcoming International Energy Forum (IEF) Ministerial meeting in Algiers at the end of September. He commented that these remain “challenging times for the global oil industry” and it was important for all stakeholders “to work together towards the stabilization of oil markets.” He said the IEF meeting in Algiers was an ideal time to meet and exchange views on the current market situation and bring together both producers and consumers. Ms Mebarki said that her country and government looked forward to welcoming Mr Barkindo as their guest in Algiers. Mr Barkindo concluded by conveying his appreciation for Algeria’s continued support of OPEC and stressed how important “Member Country support and guidance” is in his role. He looked forward to fruitful collaboration with Algeria, and all OPEC Member Countries, in the coming years.